Details and photos will be published as soon as we finish tests of the instrument. New acoustic guitar models are available - Grand Stage and Jumbo Stage. 16" Custom is a new model from our line. The first 16" model with a round cutaway. Model is available in Bebop or Historic version. We are developing an electro-acoustic bass guitar. This model is based on 17" archtop guitar. Hand crafted top and back, smaller f-holes and other constructional changes will be applied to reduce feedback. Piezo pickup, magnetic pickup or combination of both with active mix electronics is available. We are going to present a complete collection of gypsy guitar in 2008. Gypsy line contains three models: a steel string model with internal resonator and large "D" hole, steel string model with small oval hole and a nylon string model with an internal resonator and large "D" hole. All models are constructed according to plans of original guitars from 30´s. A new acoustic long scale (724 mm) baritone guitar was embedded in our catalogue line. 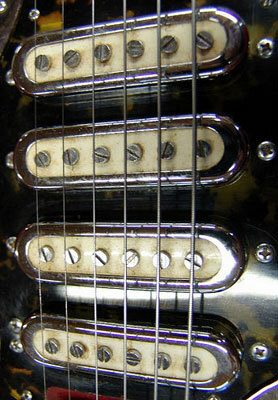 Standard tuning is: H F# D A E H.
Prochazka Custom Guitars recommend L. R. Baggs Hex pickup to avoid string unbalance. This pickup can be combined with SBS six inputs one output, possibly six inputs six outputs mix. The mix enables you to adjust the volume of each string separately. Ask us for technical details. Very rare materials for acoustic and electric guitars are available from 2008. Ask us for up-to-date offer.